Longhurst group is a housing association. We have over 18,000 homes and just under 1,000 staff, based across the East Midlands. 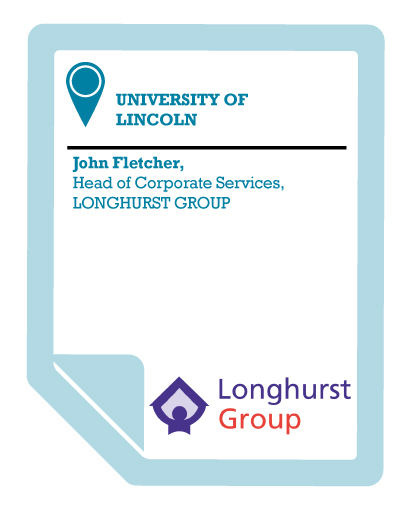 My previous role was as a Director of HR and when I was Director I was aware of the University of Lincoln because it has been a growing success story in the region over the past 8-9 years. It occurred to me why we didn’t have a closer working relationship with the University. We have an office in Lincoln and had staff going to the University to do part-time study anyway so I wanted to have a conversation with them about what they could do for us and what we could do for them. It was one of those things whereby we were both on each other’s doorsteps but didn’t know who to contact. Universities are very large organisations and it can take a while to find the best contact but once you’re in you can see there is tremendous opportunity there – all the skills and resources that they have that could help us as an organisation. The University of Lincoln has got a very clear agenda to engage with local employers, to be relevant to them and to provide the skills and knowledge that people want. I know that’s a key priority for them. We were looking for a person to help in our sustainability programme, who had the skills and knowledge in this area. The University provided a shortlist, we interviewed and picked a candidate who came in for three months initially and is still with us now in a full-time job. That was a success story. We had another person who worked in our technical programme. His background was in architecture but he was unsure about whether he wanted to go into that profession. And he had a good understanding of what we were looking for. He worked very well for 6-7 months on a distinct project in one of our other companies. We are looking for people with transferrable skills. The students we take from the University of Lincoln have a degree in the area we’re looking for, they are usually extremely keen to gain knowledge and to demonstrate to an organisation how good they are. They’re coming with a good academic background, very keen, wanting to learn and to develop themselves. We have also taken social work students onto placements as part of their course. They work in the care services that we offer in one of our companies L&H Homes. I think my favourite moment is when you see individuals come in and do really well here on an internship (eight so far) and we then take them on as full time employees. We now go to Lincoln’s careers fairs on a regular basis to promote the opportunities with our organisation and within housing more generally. There are over 40 distinct careers an individual can consider within our sector. We know sometimes that we struggle to get hold of certain resources, skills or expertise and the University may be able to help us in those areas. We get skills and expertise from students at a low cost. Our budgets are very tight and funding from the University for internships helps us obtain this resource. They are very keen and very good and really contribute positively to our work. Working with the University of Lincoln is a great opportunity to help you meet some of your operational and key strategic needs. There are a wide range of services that they can help you out on for example, advertising your jobs on their website and communication boards. We have regular meetings with the University. Sometimes they can’t help you but if they can help you, like the internship scheme, placement opportunities etc; it’s a fantastic opportunity for managers to be aware of.